Fear not what lies in the darkness, but what awaits in the morning light. O.R.B.S. 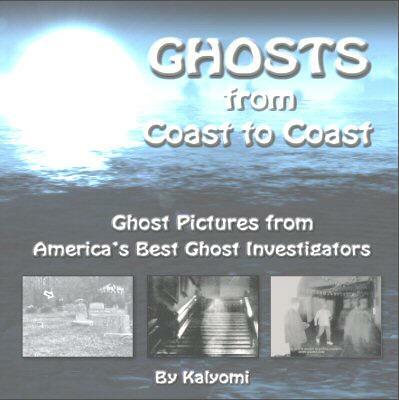 will be in the 2nd edition of Ghost, Coast to Coast, Available Now! Don't miss our ghost photo or story. "I Ain't Afraid Of No Ghost"
O.R.B.S. is the Ohio Researchers of Banded Spirits, and they are at the the Mid-Ohio Valley Players tonight to find out if the haunted tales are true or not. O.R.B.S uses technology along with a group of mediums for their investigations. O.R.B.S was started in 2007 and since then they have had dozens of haunted places in Ohio to search. Christopher Page, Founder of O.R.B.S. explains why the team is investigating the theatre, "There are stories that the original owner of the building is still here. There are reports of a phantom audience that sit here and watch the stage. There has been five deaths apparently in the theatre so there have been different stories that. We kind of want to see if we can capture those stories or maybe get some new ones for the theatre." We will have an update on this story when the investigators get back to us with their findings. Bumps in the night, eerie disembodied voices and dark-shadowed figures might scare the average Joe, but for paranormal investigators throughout Ohio, it's just another day on the job. "I grew up thinking (ghosts) were just extra playmates," said Tammy Griffiths, investigator for Ohio Researchers of Banded Spirits (ORBS). "When I got older, I realized I should stop playing with these things. They could actually hurt me at some point." The Ohio Paranormal Investigators Network (OPIN) and ORBS are two of the many ghost-hunting organizations in Ohio. While the teams are in the same field, they have differences in their approach to cases. Investigations on both sides start with a phone call or e-mail from a person who is experiencing unexplainable events. "(Sometimes it's) electrical disturbances," said Brian Parsons, director of OPIN. "Or even little animals." Once an OPIN investigator has determined the events seem unexplainable, an investigation of the haunting is opened. They sometimes make as many as 15 trips to the haunting or as few as two. Parsons said although OPIN uses tools in its investigation, they are not focused on proving or disproving the haunting. "It's icing on the cake if we can come across some evidence," Parsons said. OPIN's focus lies more on helping the person involved in the haunting, he said. Instead, they work to empower the haunted. While ORBS also starts with an interview, it hopes to use its equipment to prove or disprove the haunting while still helping the individual or family feel more comfortable in their home. After the interview, ORBS sends out a team to investigate the haunting. ORBS works in teams of two, using many different types of equipment. The teams use recorders to search for electronic voice phenomenon (EVPs), which are sounds not heard during observations, but when the recording is played back. They also use cameras and electric static meters, which sense movement in the air. After reviewing all collected data, ORBS talks to clients about its findings and discusses what else it can do to help. The ORBS team offers blessings and cleansings to clients who wish to attempt to get rid of spirits. Members of both ORBS and OPIN take their ghost investigations very seriously. They understand the importance of clients' fears and work to help them understand what is going on in their home. "A lot of times, these people are scared," Parsons said. "I mean, something is happening in their own home that they can't explain." Neither group has investigated any hauntings in Kent, but OPIN did receive an e-mail a couple of weeks ago about a possible haunting in an off-campus apartment building. Parsons said due to confidentiality restrictions, he could not disclose the location. Parson said members of OPIN were planning on coming to the residence, but a roommate was uncomfortable with the team investigating. The case remains unsettled. � The Free Library - Nellie Dingley was the first librarian at the Kent Free Library. She died while working as a nurse during World War I. Legend holds that Dingley still walks the halls of her beloved library. � Kent Masonic Temple - The temple was once the home of Marvin Kent. Bessie Kent was supposedly burned alive while working in one of the rooms and is said to still haunt the building today. It is also argued that the ghost could be that of Kitty Kent, who likes to appear in a flowing white dress. � University Plaza Theater - After hours, managers reportedly have heard footsteps, seen what appears to be patrons in the theaters and had mysterious things happen in the projection room. Contact all correspondent Pamela Crimbchin at pcrimbch@kent.edu.